The totals are in for the third quarter of 2018! The food shelf served 683 individuals and processed 3,953 pounds of food in the third quarter. Take a look at the totals below. We couldn’t do it without the support of our community! Additional statistics dating back to 2011 can be found by selecting “Our Impact” from the main menu. Since 2008, the Colchester Food Shelf has been registered as a Network Partner of the Vermont Foodbank. As a Network Partner, food can be purchased at discounted prices, to help supplement food received from the community at large. 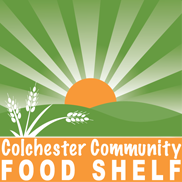 The Food Shelf relies for help and supplies on continued donations from Colchester residents, churches, schools, organizations, and businesses. Second Saturdays: 11 a.m. to 1:30 p.m.
What’s New? Check out our latest blog posts! Wondering what has been going on at the food shelf or looking for information about upcoming events? Below are highlights from our most recent blog entries. More entries and information can be found from the What’s New link at the top of the page.